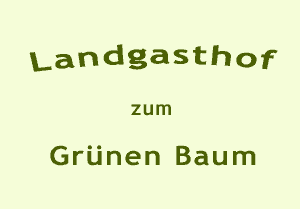 Our friendly country inn Landgasthof zum Grünen Baum has been existing since 1768. It lies at the foot of the hill Weinberg, about 6 minutes' walk from the Market Square (City center) away. A bright dining room with fireplace leads through a glass door out to the natural beer garden. Our house mountain "Weinberg" and our sledge meadow "Roter Schlag" right behind the inn invite you to a digesting walk and small and larger hikes. On our parking yard beside the house, buses can be parked as well. Until about 25 years ago, the country inn was still operated with a small farm. The chef cooks himself and guarantees as a trained cook a home-style cuisine. Our country inn is being run jointly by the 4th and 5th generation.